Borussiae Regnum complectens Circulos Sambiensem, Natangiensem et Hockerlandiae nec non Borussia Polonica Exhibens Palatinatus Culmiensem, Marienburgensem, Pomerelliae et Varmiae - Lotter, T.C. Title : Borussiae Regnum complectens Circulos Sambiensem, Natangiensem et Hockerlandiae nec non Borussia Polonica Exhibens Palatinatus Culmiensem, Marienburgensem, Pomerelliae et Varmiae. Size : 19.4 x 22.6 inches. / 49.3 x 57.5 cm. 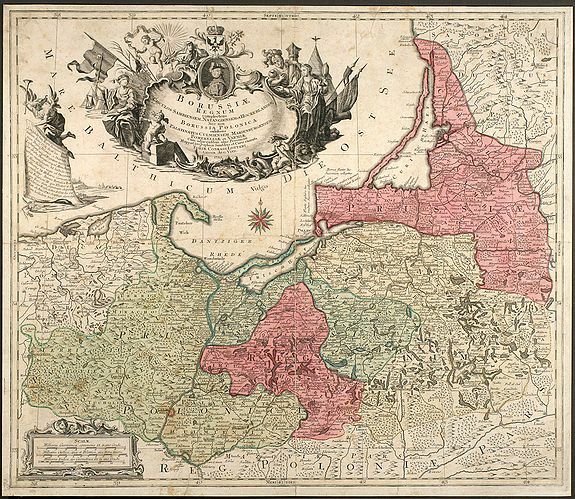 Description :Decorative copper engraved map of Poland by T. C. Lotter. Covering the area around Dantzig (Gdansk), Elbing (Elblag) and Königsberg (Krolewiec). The map has a highly decorative figurative and allegoric cartouche. First state, dated 1759 in the cartouche. Condition : Centerfold split and margins backed, minor soiling, some tears backed.